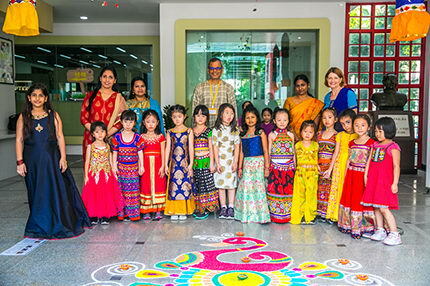 On Wednesday 7th Nov. staff, students and parents celebrated the Indian ‘Festival of Lights’. This festival is held each year in India and other parts of the world and is celebrated with feasting, gifts, and the lighting of lamps. Here at GOS we celebrated by creating a Rangoli art piece for our reception area. This beautiful peacock was made with coloured rice and flour. 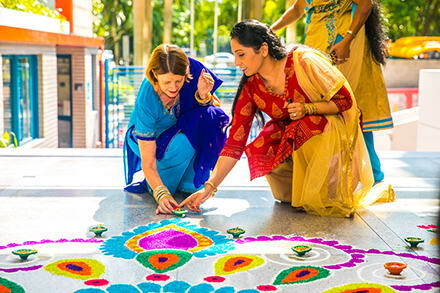 Rangoli patterns are created in courtyards and foyers during festivals and often are regarded as bringing luck for the year ahead. Staff and students were treated to Indian sweets at lunchtime made of crushed cashew nuts and children were encouraged to wear traditional Indian costumes to celebrate this special day.